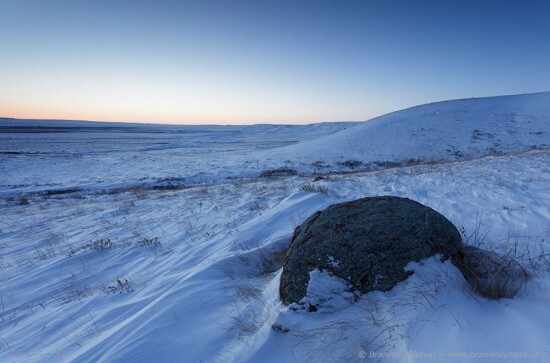 Canadian Prairies were hit by a strong snow storm in early November. We received between 20 and 30 cm of fresh powdery stuff. 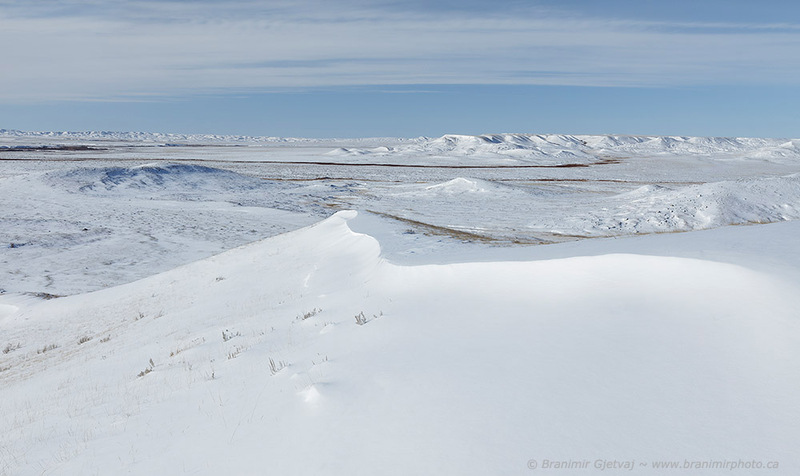 I happen to be in Grasslands National Park as the storm was passing through and spent two days photographing snow-covered prairies. I have photographed in the park during winter before. However, I have not seen the park so white and pristine. Snow storms come and go, and in this part of Saskatchewan the fresh snow cover does not last too long. It is either blown away by strong winds or partially melted by warm chinooks arriving from Alberta. Driving conditions were so bad that we decided to stay at home until the storm was almost over. I wanted to photograph the snow fall with something dark in the background (so I can see individual snow flakes). The first place we visited were large cottonwood trees growing along the Frenchman River south of Val Marie. Weather was not cooperating – it snowed heavily while we were driving south and then stopped soon after we arrived to the park. 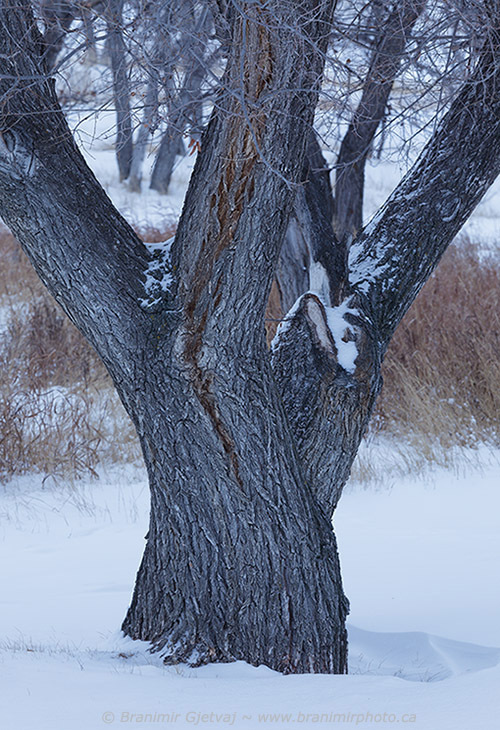 I will have to get my “snow storm in the grasslands” images some other time. It was still foggy and overcast the next morning and we just wandered through the park. The scenery felt eerie stark and desolate. An endless snow desert; the only other living creature I was aware of was my buddy Larry, appearing as a small speck on the other side of the hill. Clouds cleared out later that day and we were able to see further out in the valley. Our world expanded; Seventy Mile Butte on the west horizon, Frenchman River meandering through the pristine white landscape. I have not seen the park so clean and beautiful before. 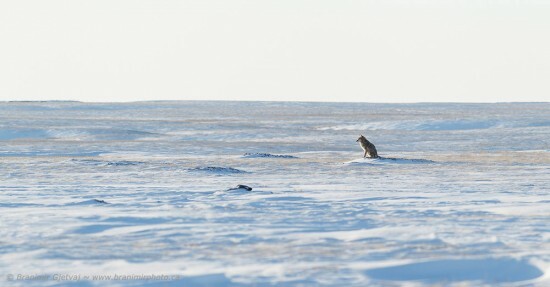 On the way back to Val Marie we saw a coyote hunting at the black-tailed prairie dog colony. The animal did not seem to be alerted by our presence. 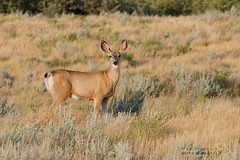 It continued sitting in front of one burrow, listening intently to any signs of movement below the surface. The scene reminded me of the iconic image of a lone polar bear in the Arctic by Thomas Mangelsen, “Born of the North Wind“. We returned to the park later that evening for more photography. 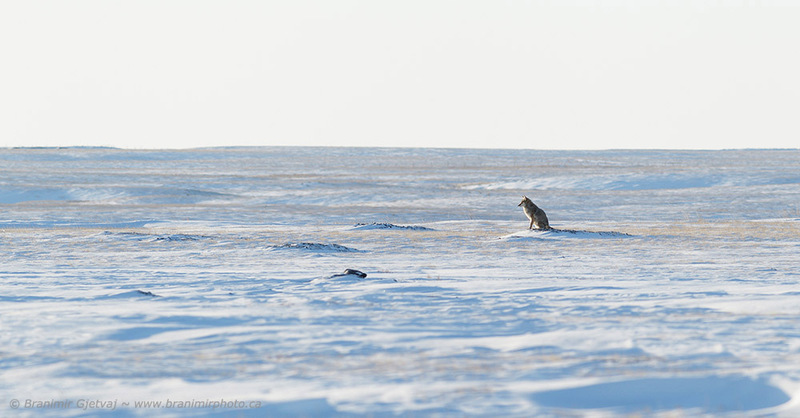 Here is one image from this set that conveys the feeling of isolation and frigid environment that can be experienced on the prairies in winter. Temperature dropped to -28 C over night. A bit too cold for early November. 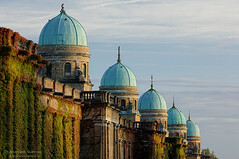 Looked very cold Branimir. I like the shot with the coyote (the narrative helps). I think it could be a good book image.